Check out how Marathon electric water heater, with the innovative engineering, high-efficiency operation, and long lasting design, is the perfect solution for one family and its residential water heating needs. Find out what makes it different from other electric hot water heaters. Superior design is what makes Rheem Marathon hot water heaters one of the toughest on the market. The tank is not made of metal as most of today's heaters, but from seamless blow-molded polybutene that makes it lightweight and rust free, while the tank's concave bottom allows full draining and easy removal of the sediments. The non-metallic design eliminates the need for the anode rod, its maintenance, service, and development of the rotten egg odor. The filament wound fiberglass allows the tank more flexibility and to withstand higher pressure than conventional electric heaters. The water heater is enclosed in the rugged polyethylene jacket that resists the damage and rust. The dip tube can withstand higher temperatures, and special design allows the turbulent water flow, which reduces the sediment build-up problem. Heating elements are of low-watt density, which allows greater performance and longer life. Thermally fused upper heating element provides protection against dry-firing while titanium lower element on some models prevents the lime build-up. When buying a Marathon electric water heater, let's say 50-gallon, you have an option to buy one of the three different models, which use 3000-, 3800- and 4500-watt heating elements. The heater with the strongest element will provide better recovery rate but will need a stronger fuse. You can buy a Marathon water heater in sizes from 15 to 105 gallons, where the most popular sizes 50-gallon is available as the tall and short model, and all models have the energy efficiency over 90%. Models with the 85 and 105-gallon tank are built for heavy-duty use and have the 10-year warranty. For storing hot water in the solar, geothermal or indirect water heating systems, Marathon thermal storage tanks are the ideal solution and are offered in sizes from 50-gal to 105 gallons. One of the main advantages of Marathon electric water heater is the lifetime warranty on the tank, and, as advertised, you won't need another water heater in your lifetime. Thanks to the plastic design the heaters are lightweight, easy to move and install. This is what makes a heater environment-friendly; so you won't need to dispose of it after 10 years or so. Due to the bowl-shaped bottom and with the drain valve installed at its very bottom, it is possible to have a complete tank drain which is great in a case of the sediment and lime scale build-up. The foam insulation is very thick, 2.5 inches, and since the heat loss is only 5 F in 24 hours, this is what makes Marathon a great at thermal energy storage. 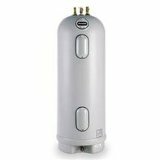 Marathon electric water heater is built in the USA and the brand is owned by Rheem. It provides a superior performance, quality, and reliability over other models. They can be used as the electric water heater or hot water storage when used with the heat pumps, solar and geothermal heating.